# Don��t rot, mold, decay, shed or attract the bird and insert. # Breathable, bendable, fire retardant and environment friendly. # Long life span, life span up to 20 years. # Suitable for the windy, dry, and tropical weather condition. # Easy installation and free from maintenance. Our Synthetic Thatch is made of synthetic resin, is a new landscape ideal material for roof decoration. 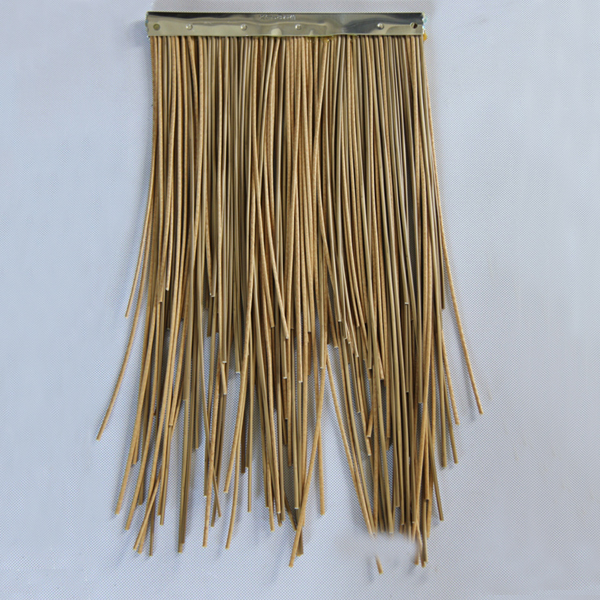 Synthetic Thatch can be used for holiday ,resorts, promenades,beer gardens, beach front hotels, side-walk cafes, restaurants, swimming pools, etc. Synthetic Thatch's natural decorative defection will bring you back to the nature relax your mood. 1. The normal size is 6mm*250mm*460mm and 6mm*500mm*460mm . 2. Use 6 or 12 PCS in one square meter . Create an authentic tropical look in your garden. Create an entertainment area next to your pool. Create a tropical look in pubs, Restaurants, etc. # We could produce at customer's request. # Vacuumed package and can be packed according to client's requirement. # Special specification products may be made according to order. 1. Lay the wooden framework at the roof which has made water-proof processing (wooden framework is the base to pave wood plastic board). 2. Pave wood plastic board or other materials. 3. Make installation reference line on the wood plastic board, whereof, 30mm interval at eaves and 65mm interval at roof. 4. Bind thatch tiles along the reference line from the eaves, please avoid stamping on the thatch tiles while paving. 5. Make some adjustment such as the thatch curvatures and make them smooth and natural. Copyright©2009 XINGLI BAMBOO PRODUCTS COMPANY All Rights Reserved.